RNA interference (RNAi) is a type of experiment performed to test the function of interesting genes. RNAi is a valuable research tool used on living organisms. The method works by introduction of synthetic, double-strand RNA fragments into cells, which selectively reduce the production (also known as expression) of one gene. If this gene is essential to the normal function of the salmon louse, we will be able to observe changes in the development or behavior of the animal (phenotypic changes). At the SLRC we have currently tested 40 genes using RNAi. Double-stranded RNA is injected into the adult female lice using very thin glass needles. After a few hours of recovery (in a bucket of cold water! 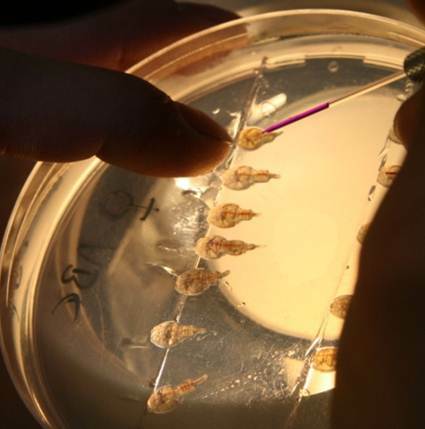 ), the lice are placed back on the fish in separate, transparent tanks. The fish and the salmon lice are monitored daily for 6 weeks. The experiment is terminated when females produce strings with eggs. Both, adult female salmon lice and their offspring (egg strings) are harvested and tested for changes in gene expression and phenotype. 4 RNAi experiments will be performed at SLRC in the wetlab facilities of University of Bergen and Institute of Marine Research.